Have you ever read about the Minutemen from the Revolutionary War and just become curious about the skills they possessed? Living near the Colonial Triangle of Jamestown, Williamsburg, and Yorktown, Virginia, I visit often and am reminded of the history behind America's struggle for independence. I recently undertook one of those little challenges in life to take a class to learn a classic American skill that I had wanted to learn for a long time and study some American heritage. At the same time, due to the content, I attempted to observe the class from a third-person perspective that would allow me to report back to you, knowing that we musicians are a philosophically and politically diverse bunch. Recently, after purchasing a classic, historic rifle, I decided I wanted to learn to shoot a rifle properly, in the way the military used to train soldiers to shoot. Like most other good things, lessons cost a lot of money so I began looking for a course that wouldn't break the bank. I found one when I stumbled across a two-day class in marksmanship and American heritage called the Appleseed Project. The rifle instruction side: Though they go through a rigorous training process (and in fact, many are NRA instructors), the Appleseed instructors are unpaid volunteers. The class is offered at cost. Well, sort of: Women, children, and members of the military are taught free. Yup. Free. As a male civilian, I paid $70 for two LONG days of instruction. There are expenses: You need your own rifle, though some instructors seem to own a loaner or two and might offer to loan you one if you were to contact them before the shoot. An inexpensive .22 cal rifle that can be modified to work well for this application (the Ruger 10/22) can be had for about $200. With the $70 tuition, the rifle, and most accessories and supplies, you'll probably spend less than $500, but everything you buy becomes your own. You’ll be furnishing your own lunch, snacks, and water as well. What do you get for your pennies? Somewhere around twenty hours of intense instruction, both individual and group. There are demonstrations, lectures, and lots of shooting. The instructors call it “trying to drink from a fire hose,” because they are compressing a week’s worth of Army training into two days. On the website they suggest you study and practice before you get there, and they provide lots information via their forum. You will be shooting on an extremely well-managed firing line with safety being THE FIRST CONCERN. On my first day there was a student/instructor ratio of three or four to one. On the second day we had less shooters so it was more like two or three to one. It’s a rough grind. You spend a good portion of the course time shooting at one-inch square targets set at twenty-five meters (82 feet). For you shooters, that is four minutes of angle. You shoot the three positions: prone, seated, and standing. Towards the end, you begin shooting a version of the Army Qualification Test, checking your ability at 100, 200, 300, and 400 yards. Your score places you in one of five standard Army categories: unqualified, qualified, marksman, sharpshooter, and expert (rifleman). Those who shoot an expert score earn a patch at the end of the weekend. The American heritage side: Interspersed with the rifle training is a comprehensive historical narrative of the events of April 18-19, 1775. Anyone remember what that happened on that date? The 18th was the night of Paul Revere’s ride. The following day was the date of the first battle of the Revolutionary War, the Battle of Lexington and Concord. That battle was decided by the average “Joes” from the region who decided they could no longer tolerate invasions of their human rights by the British Military government. They took up their arms, made a stand, and dealt the British Army a pretty crushing defeat. The colonials were made up of three groups: The Minutemen, the Militia, and the home guard. The point of this whole exercise, both historical and practical, is to awaken the American populace to the need for the average citizen to be involved in the day-in-day-out conduct of the American experiment in self-governance and to make the sacrifices necessary to protect our rights and hold our elected representatives’ feet to the fire. The instructors illustrated their historical teachings with maps, artifacts, and period armament, all of which contributed to the immediacy of the narrative. When they talked about how imposing a fully-equipped British soldier was as he carried his gleaming musket towering up to about seven feet, they demonstrated it by bringing out a gleaming .69 caliber French Charleville musket complete with a wicked 18” bayonet, a pretty good stand-in for the British Brown Bess. Now imagine 700 of these advancing at you with a loud clomping of boots and the sound of drums beating the marching cadence, as they did on April 19th. The entire sensory effect of a maneuvering group of British regulars was designed to intimidate. And it worked! Here I want to emphasize a point: For my friends of sundry philosophical and political persuasions, these recountings of history were, a) very balanced, giving both the British and Colonial perspectives, and b) extremely apolitical. This is a subject I’ve studied rather at length. The latest book I’ve read on the subject is The Day the American Revolution Began, by William H. Hallahan, one of those balanced books that tells both sides of the tale. I picked it up at the official Colonial Williamsburg book shop. As I mentioned, I went into the weekend sensitized towards any conservative bias that might offend and run off my many friends of other persuasions. I can tell you that the entirety of the weekend was conducted with as little conservative rhetoric as is possible. When the one or two little comments slipped out, the instructors corrected themselves on the spot. They really make an effort to be apolitical. This program is intended to be interesting and inviting to folks of all stripes, genders, and ages. The Appleseed project is not a recruitment program for any militia or armed group. It is not a 2nd Amendment support project. At the end, you aren’t inducted into a secret society. There is no hidden agenda. It is simply an attempt to re-establish a traditional American skill set and to re-awaken a traditional American sense of personal responsibility. In three years, the program has spread nationwide, with clinics being carried out in every area of the country, usually more than once a year. At this point the teams have trained over 10,000 students in the program’s short life. Though I've shot since I was about eight, I'd never had any formal training. I worked my BUNS off for this. 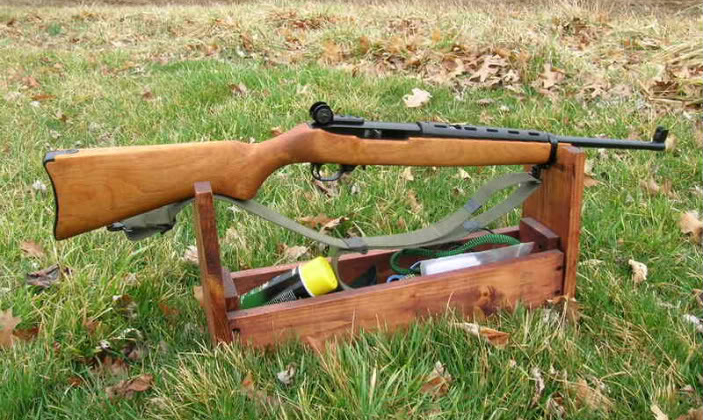 To save ammo money I built a .22 caliber training rifle and zeroed it. I came away with the tools to improve my own shooting, a goal to shoot for, and a better appreciation for the sacrifices of the average colonial citizen who poured himself into the founding of this country, as well. In our modern age of medical insurance and the Geneva accords, we forget that injury or capture often meant death back then. I can recommend the Appleseed Project to anyone who is interested in the founding of this country or has an interest in learning to shoot a rifle. There were several man and wife, father and son, and father and daughter teams who participated and enjoyed the event. A complete schedule and more details are available on the the Appleseed Project website, HERE.